lucie sheridan blog spot: Ahoy there! The image above is The Matthew, here is some info on the wonderful ship. Over 500 years ago John Cabot and his crew set sail for Asia aboard the original Matthew hoping to trade goods and commodities with the people who lived there. However, he finally arrived on the coast of Newfoundland and therefore was the original discoverer of North America, not Christopher Columbus as most people believe. Today the replica of the Matthew sits proudly in Bristol harbour for all to see. The general public are able to board the Matthew as well as embark on trips around the harbour. 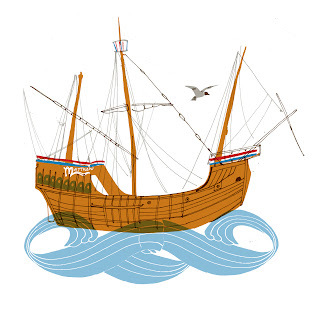 In 1997 the replica Matthew followed the same course as John Cabot in 1497 and sailed across to Newfoundland. It carried the same number of crew members as the original and took the same and used the same amount of time to complete the crossing.